William Irwin attended Marietta College in 1848. After college, he worked as an assistant teacher at Port Gibson Academy in Port Gibson, Mississippi for one year. He returned to Marietta College and taught there for two years. In autumn of 1851, Irwin booked passage to California, passing up an opportunity to study law in Chicago. After arriving in San Francisco he headed to Oregon where he joined his uncle’s lumber business. In 1854, he returned to San Francisco and opened a lumber yard. Virtually a jack-of-all-trades, Irwin owned a slaughterhouse, a livery stable and stage coach line before entering politics. 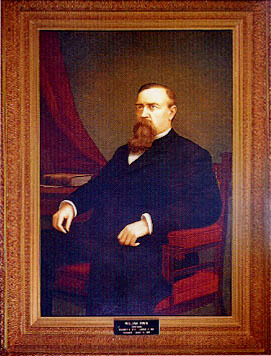 In 1862, Irwin was elected to the State Assembly representing Siskiyou County and was re-elected for the 1863 session. In 1865, he ran for the office of Siskiyou County Tax Collector, but was defeated. In January 1866, Irwin purchased the Yreka Union and worked as an editor on the weekly paper. By 1871 he was both the publisher and editor of the Union. In 1869, Irwin was elected to the state Senate for a two-year term. He was re-elected in 1873. That year Irwin served as the President pro Tempore and assumed the role of acting Lt. Governor when Pacheco became Governor. During Irwin's term as Governor, paper money was widely introduced. Irwin fought to keep California a "hard money" state, preferring gold and silver instead. He also believed that the power to issue pardons should be taken away from the Governor. Former Governor Low said that Irwin "made his reputation by looking wise and keeping his mouth shut." Use the California State Library’s interactive tool to view Executive Orders and Proclamations signed by Governor Irwin.